Resource center Discussing the Benefits of Sober Living How Long Should One Stay in a Sober Living Halfway House? Halfway house: A halfway house is generally a structured environment that may be regulated by federal or state governments. These homes provide a place for individuals leaving either mandatory (such as prison or court-ordered treatment programs) or voluntary addiction recovery programs. Individuals may stay in a halfway house for a period of six months to a year or two, as long as they remain sober, refraining from any alcohol or drug use. Periodic drug screenings and breathalyzer tests are likely required to remain in residence. Some halfway houses that are federally funded may have shorter lengths of stay due to budgetary restraints. Oxford House: As a nonprofit organization, an Oxford House provides a drug-free environment for people in addiction recovery. Most homes house 6-15 individuals. There are separate homes for women, men, and women with children; there are no coed homes. An Oxford House is democratically run and financially self-supporting, and many residents were previously homeless or have spent time in jail. Usually, individuals may stay as long as they wish, provided they continue to follow house rules and regulations. Sober living home: A sober living home (SLH) is not generally funded by state or federal resources, and therefore may not be regulated or licensed the same way. Many choose to become affiliated with the Sober Living Network, which requires that they adhere to quality standards. SLHs may have fewer restrictions on the length of time a person may stay in the home. Individuals may be able to continue living in a SLH as long as they comply with all house rules and remain drug- and alcohol-free. While there may be different types of sober living communities and environments, most follow some general guidelines and structures. All require complete abstinence as this has been proven to increase the likelihood of a sustained recovery and minimize episodes of relapse. A study published by Psychology Today shows that individuals who remain sober for at least a year only relapse about 50 percent of the time, while only 15 percent of those who are abstinent for five years relapse. Sober living homes provide a peer support network of other individuals who are also in recovery and who have similar goals for remaining abstinent on a long-term basis. Sober living environments are often a follow-up to a more structured addiction treatment program. Treatment facilities may provide referrals or direct admission into a sober living home after being discharged from a residential treatment program. In some cases, the court or prison system may mandate a stay in a halfway house, and in these cases, individuals are likely admitted or referred directly. Otherwise, individuals may find a sober living home on their own and request admission. When looking for a sober living home, it can be helpful to ask people in 12-Step group meetings or other support groups for information on local homes and potential availability. While many individuals may enter into a sober living home directly from an addiction treatment program, others may not have undergone any formal treatment and may just be seeking a sober environment outside of formal treatment methods. Some homes may require a majority vote in order to become a resident. For example, the journal Psychological Services publishes that Oxford Homes require prospective tenants to achieve an 80 percent majority of agreement from house residents in order to become a member. Others may simply require that there is an opening, or an empty bed, in the home and for the individual to be in recovery from a drug and/or alcohol addiction with the desire to remain sober. Many sober living homes and Oxford Houses are single family homes in residential neighborhoods. Resources for finding one include substance abuse treatment providers, 12-Step groups, mental health professionals, and state behavioral health services. The Substance Abuse and Mental Health Services Administration (SAMHSA) also provides a Behavioral Health Treatment Services Locator tool to help individuals find particular addiction treatment and recovery services in their local area. 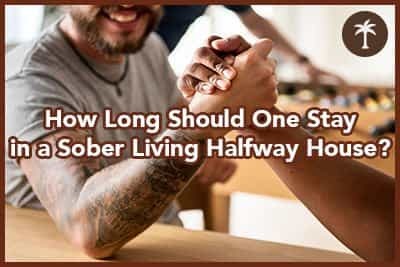 While sober living homes do not require individuals to attend formal treatment while living there, it is strongly recommended that residents at least join a peer support or 12-Step program like Alcoholics Anonymous (AA). When the sober environment is combined with regular attendance at a 12-Step program, abstinence may be more easily sustained, the Journal of Psychoactive Drugs postulates. In many cases, individuals may still attend weekly sessions, meetings, educational programs, and other outpatient addiction treatment services while residing in a sober living environment. Some homes may have a policy expecting residents to spend a certain number of nights in the home; others may have curfews; and still others may perform random drug tests to ensure compliance with the abstinence rule. Sober living homes may have particular rules about visitors and respectful roommate behavior. They may have weekly house meetings to check in with each other and make sure all residents are pulling their own weight and feeling supported in their recovery. Each home may be structured slightly differently, so it is a good idea to learn expectations and requirements of a particular home before moving in. A sober living home can provide an affordable option for a drug- and alcohol-free environment wherein individuals can be supported as they transition out of treatment and back into the community. Many sober living homes allow residents to remain within the home as long as they need to, as long as they continue to follow the rules set up by the house and its residents. Each individual may go through treatment and recovery differently, so there is no set length of time that works for every person. Longer times in treatment and transitional environments, where individuals are surrounded by others who support sobriety, may help people suffering from addiction to form healthy habits and learn how to best use the tools learned in treatment. After a period of time in a transitional environment like a sober living home, individuals may return to work or school while living in the home. They may be able to slowly reintroduce some of the trappings of “everyday” life while staying in an environment that supports their sobriety. Once individuals feel ready, they may put in their notice at the sober living home and transition back into a standard living environment.